Nordic Tugs have been a long-time favorite of serious coastal cruisers because of their solid performance, high quality, and salty looks. 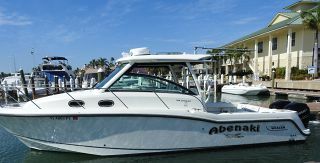 Since its storybook beginning in 1980 when its charming little 26-footer caused a stir at the Seattle Boat Show, this American company has built over 800 boats ranging in size from its 26 to its flagship 54. Not long ago, I took a new 54 on a 1,000-mile cruise from Vancouver, British Columbia, to Juneau, Alaska, and learned firsthand why these tugs have garnered such a cult-like following. Their semi-displacement, single-engine designs deliver sea-kindly, efficient performance at a variety of speeds. And their raised pilothouses are ideal for running the boat in all weather conditions. 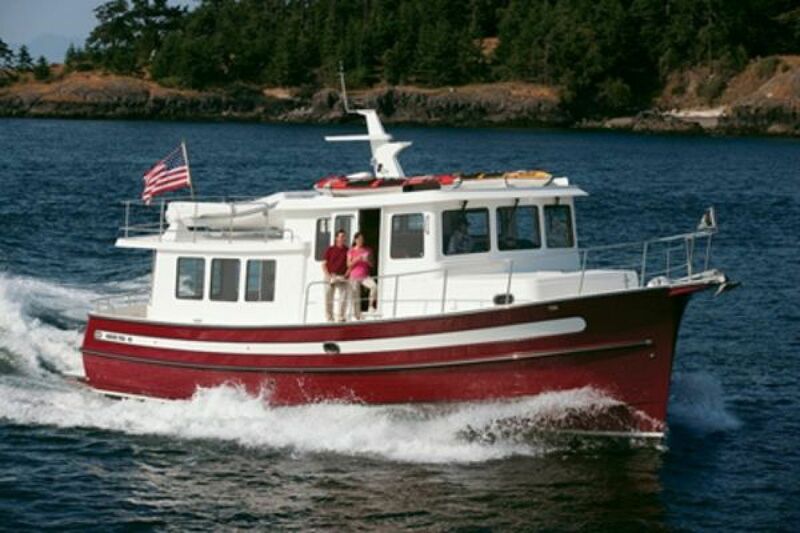 While the new 49 retains the character of the entire fleet (now consisting of a 26, 32, 37, 42 and 54), it is the first Nordic Tug designed by Howard Apollonio of Bellingham, Washington. 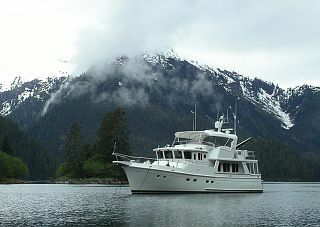 Previously, the highly respected Lynn Senour of Seattle, who passed away four years ago, designed the Nordic Tug line. 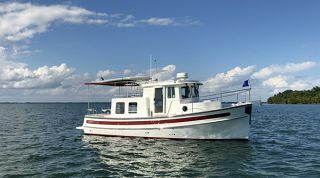 The 49 keeps the salty look of its siblings, including a faux-planked fiberglass hull, the company's trademark stack, a sweeping sheerline, and vertical pilothouse windows. A close look reveals more rounded, smoother shapes that give it an updated, more contemporary appearance. Changes to the hull form have made noticeable improvements in performance. A prop tunnel allows for a larger diameter propeller, while reducing draft to less than four feet. By reducing the shaft angle, the tunnel also improves efficiency, and according to Nordic Tug, the 49 is more efficient at displacement speeds than its 42. To eliminate hull slap at anchor, the forward chines have been raised, and to reduce spray, the bow is more flared than those of its siblings. A full keel protects the shaft and prop and contributes to directional stability, easy to appreciate when docking in the wind or running an inlet with following seas. Of the 800 Nordic Tugs built, only a few were ordered with stabilizer systems, a tribute to the hull's stability. I ran hull number one of the 49 from Anacortes to Seattle, a distance of 60 miles. Taking the outside route, she ran comfortably at 14 knots while burning 1.3 gallons per nautical mile. At this speed she has a range of more than 500 nautical miles. Many Nordic Tug owners run their boats at displacement speeds to save fuel, and at 8 knots the 49 burns just 0.7 gallons per nautical mile, doubling her range. Top speed is 17 knots, but at an elevated fuel burn. The primary advantage to a semi-displacement, coastal cruiser is the choice of running at fuel-sipping displacement speeds or having the option of pushing the throttle and covering a lot of miles quickly. This extra speed can make the difference between getting caught in nasty weather or sitting comfortably in a protected anchorage. The 49 has one 610-horsepower Cummins QSM 11 electronic diesel engine, the single being consistent with other Nordic Tug models. The only exception is the 54, which can be ordered with a single or twins, and the sales are split evenly between the two. The 49's engineroom has plenty of room for maintenance and service. Noticeable on the 49, and characteristic of other Nordic Tugs, is the attention to the setup and installation of systems and equipment. Wire runs are neatly done and properly marked. Fuel-management systems are easy to understand, and all valves are within reach. All systems seem to be installed with the understanding that they need to be serviced. 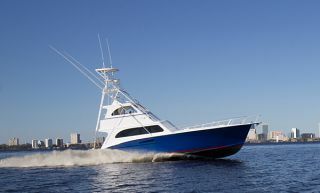 The focal point of activity during passages is the 49's pilothouse, which offers excellent all-around lines of sight from a centerline helm featuring a Stidd chair and a large console with room for a full array of electronics. Traditional navigators will find an area for plotting and drawers for charts, cruising guides, and tools. A U-shaped settee seats four around a teak table that converts to a double berth, creating an extra stateroom when needed. 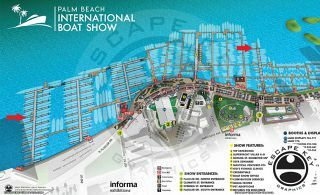 An optional flying bridge integrates well with the boat's profile, according to the drawings, and would be an excellent choice for cruising in warm climes. The upper deck can hold a 12-foot tender and outboard, and this boat sported a 1,000-pound Steelhead davit. An extra-wide main salon limits the width of the exterior side decks. Moving from the cockpit to the foredeck requires stepping carefully along the deck while holding onto the cabin roof railing. 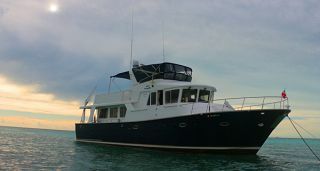 At the pilothouse door, the deck widens and a safety rail runs forward to the bow. 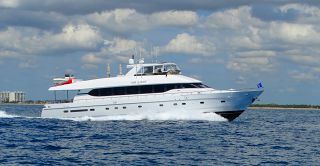 The resulting interior space is impressive, with a comfortable seating area, an entertainment center, and a flip-up dining counter adjacent to a well-equipped galley. 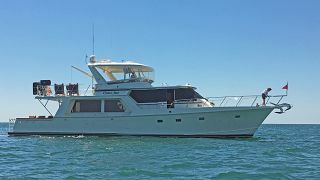 Resisting the temptation to fit three staterooms into 49 feet, Nordic Tug designed this boat for one couple with occasional guests. To reach the accommodations, six spiral steps lead down from the pilothouse to the lower level, where the entrance to the forward VIP stateroom is located. It features a queen-sized island berth, plenty of stowage, and a washerdryer combo. The head has two doors, making it accessible to other guests. The midships master stateroom is located down another three steps and takes advantage of the vessel's full beam. Featuring a queen-sized berth, a dresser and vanity, a cedar-lined closet and private head, it is fitted out with Nordic Tug's signature teak woodwork and tasteful appointments. Throughout the boat, there are opening ports, hatches, and Diamond Sea Glaze windows, allowing for cross ventilation. The 49 represents the best of the respected Nordic Tug line. Without bells and whistles, it instead delivers good, honest performance, comfortable accommodations, and reliability.